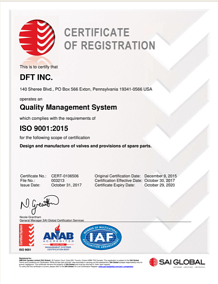 DFT’s Management System has been certified to ISO 9001:2015 in the scope of design and manufacturing valves and provisions of spare parts. As an ISO certified organization, DFT Valves holds its operations to the highest level of quality standards. Download a copy of our ISO certificate by filling out the form on the right.